The electrocardiogram (ECG or EKG) is a noninvasive test that is used to reflect underlying heart conditions by measuring the electrical activity of the heart. By positioning leads (electrical sensing devices) on the body in standardized locations, information about many heart conditions can be learned by looking for characteristic patterns on the ECG. Understanding the parts of the ECG. During each heartbeat, a healthy heart has an orderly progression of depolarization that starts with pacemaker cells in the sinoatrial node, spreads out through the atrium, passes through the atrioventricular node down into the bundle of His and into the Purkinje fibers, spreading down and to the left throughout the ventricles. This orderly pattern of depolarization gives rise to the characteristic ECG tracing. On the printed ECG, each small square represents 0.04 sec. Large squares on the paper represents 0.2 seconds. 1) P-waves. P-waves represent atrial depolarization. Atrial depolarization spreads from the SA node towards the AV node, and from the right atrium to the left atrium. In sinus rhythm, there should be a P-wave preceding each QRS complex. 2) PR interval. The PR-interval is from the start of the P-wave to the start of the Q wave, at the beginning of the QRS complex. This interval reflects the time the electrical impulse takes to travel from the sinus node through the AV node (i.e. the time taken for electrical activity to move from the atria to the ventricles). 3) QRS complex. The QRS-complex represents depolarisation of the ventricles. It is seen as 3 closely related waves on the ECG (waves Q, R & S). Because the ventricles have a large muscle mass compared to the atria, so the QRS complex usually has a much larger amplitude than the P-wave. The point at which the QRS complex finishes and the ST segment begins is known as the J-point. 4) ST segment. The ST-segment starts at the end of the S-wave and finishes at the start of the T-wave. 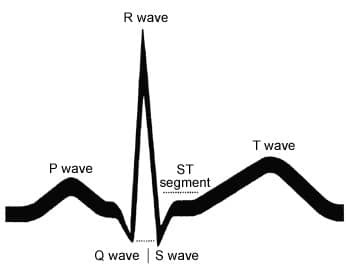 The ST segment connects the QRS complex and the T wave; is an isoelectric line that represents the period when the ventricles are depolarized (i.e. contraction). 5) T-wave. The T-wave represents ventricular re-polarisation. It is seen as a small wave after the QRS complex in all leads except aVR and lead V1. 7) QT-interval. The QT-interval starts at the beginning of the QRS complex and finishes at the end of the T-wave. It represents the time taken for the ventricles to depolarise and then repolarize. Lead refers to an imaginary line between two ECG electrodes. The electrical activity of this lead is measured and recorded as part of the ECG. A 12-lead ECG records 12 of these “leads” producing 12 separate graphs. On a standard 12-lead EKG there are only 10 electrodes, which are listed in the table below. On the right arm, avoiding thick muscle. In the same location where RA was placed, but on the left arm. On the right leg, lateral calf muscle. In the same location where RL was placed, but on the left leg. In the fourth intercostal space (between ribs 4 and 5) just to the right of the sternum (breastbone). In the fourth intercostal space (between ribs 4 and 5) just to the left of the sternum. Between leads V2 and V4. In the fifth intercostal space (between ribs 5 and 6) in the mid-clavicular line. Horizontally even with V4, in the left anterior axillary line. Horizontally even with V4 and V5 in the midaxillary line. Limb leads. Leads I, II and III are called the limb leads. The electrodes that form these signals are located on the limbs—one on each arm and one on the left leg. The limb leads form the points of what is known as Einthoven's triangle. Augmented limb leads. Leads aVR, aVL, and aVF are the augmented limb leads. They are derived from the same three electrodes as leads I, II, and III, but they use Goldberger's central terminal as their negative pole which is a combination of inputs from other two limb electrodes. Precordial leads. The precordial leads lie in the transverse (horizontal) plane, perpendicular to the other six leads. The six precordial electrodes act as the positive poles for the six corresponding precordial leads: (V1, V2, V3, V4, V5 and V6). Wilson's central terminal is used as the negative pole. Spatial interpretation of the ECG leads. Each of the 12 ECG leads records the electrical activity of the heart from a different angle, and therefore align with different anatomical areas of the heart. Two leads that look at neighboring anatomical areas are said to be contiguous. In the figure below, contiguous leads are labeled in the same colour. Interpretation of the ECG waves. Electrical activity in the heart flows in many directions at once. Because each lead records the electrical activity of the heart from different directions, each lead is different in shape. Thus, if the electrical activity of the heart travels towards a lead, you get a positive deflection. Vice-versa, if the electrical activity moves away from a lead, you obtain a negative deflection. The wave seen on the ECG represents the average direction, and the height of the deflection accounts for the amount of electricity flowing in that direction. If the R-wave is greater than the S-wave it suggests depolarisation is moving towards that lead. If the S-wave is greater than the R-waves it suggests depolarisation is moving away from that lead. If the R and S-waves are of equal size it means depolarisation is travelling at exactly 90° to that lead. Rate, rhythm and axis from an ECG. 1)Rate. The ECG paper runs at 25 mm/sec through the ECG printer. Use the sequence 300-150-100-75-60-50-43-37. Count from the first QRS complex, the first thick line is 300 bpm, the next thick line 150 etc. Stop the sequence at the next QRS complex. When the second QRS complex is between two lines, take the mean of the two numbers from the sequence. In case of tachycardia (>100 beats/minute), count the small (1mm) squares between two QRS complexes and divide 1500 (25 mm/sec x 60 sec) by the number of squares to obtain heart rate. 2)Rhythm. The heart rhythm can be regular or irregular. Irregular rhythms are regularly irregular (i.e. a recurrent pattern of irregularity) or irregularly irregular (i.e. completely disorganised). Mark out several consecutive R-R intervals on a piece of paper, then move them along the rhythm strip to check if the subsequent intervals are the same. 3)Axis. The axis of the ECG is the average direction of the overall electrical activity of the heart. When talking about to the ECG axis is it generally the QRS axis that is being referred to. The normal QRS axis is between -30 and +90 degrees. The most efficient way to estimate axis is to look at leads I + aVF. The diagram below illustrates the relationship between QRS axis and the frontal leads of the ECG. Other methods such as the “isoelectric lead” can be used to estimate the axis. Some cardiac conditions observed by deviations on the ECG. Please check the following websites, which have been useful to us while putting together this summary for understanding the ECG.